Unraveling the self satisfied, self congratulatory and twisted logic of all who have forgotten or never learned what makes America great. One way or the other, Sarah Palin will have the biggest impact on the GOP’s chances to win the presidency in 2012. Her recent editorial in the Wall Street Journal supporting Rep. Paul Ryan's economic deficit reduction and economic growth plan is simply her latest in a series of comments on the important issues for America. Her astuteness in these matters is apparent. No, I don't care if she actually writes these, although there is no reason to believe she does not. Whether she does or not, it is apparent she understands their importance and meaning. The two areas where the Federal Government can do the most damage domestically are: 1) the fiscal issues of tax and spending policy, i.e., too much of both; and, 2) regulatory nihilism----in particular relating to the ad hoc restriction of property rights unilaterally by the executive branch. This happens when the Government implements and interprets vaguely written laws with "unintended" consequences. Examples include the recent Chrysler and GM bailouts, unfunded mandates of all kinds; defining CO2 as a pollutant; the already unchecked power of the EPA overall; and the upcoming Big Kahuna, "Obamacare". Ryan's proposal, A Roadmap for America's Future, addresses the first issue most directly and parts of the second issue indirectly (for example, his proposals to change Obamacare). I think his plan is a good plan. It is good primarily because it exists at all. If it were up to me the plan would be more simple. About 2/3rds of the forward federal budget are entitlements. Basically, the way our entitlement system works is as follows. It taxes 1 dollar from one group of people and promises 2 dollars to another group of people. All of us are in both groups, although at different times in our lives and for different forms of entitlements. This is not hyperbole, just a simple statement of what the Government does in fact. The ratio of 1 to 2 may be different, but you get the point. What does this mean? It means as a nation we are less wealthy than our official balance sheet says we are. Think of your own assets and liabilities. If you are like me there is one liability you ignore, the debt of the federal (and state) government, which can only be paid with your taxes, (which is what politics is about, i.e., "who gets and who pays?"). On average, a family of four owes about $140,000 using the most favorable accounting in federal debt. It is really a multiple of that when one factors in the growth path of entitlements, as they are growing far faster than our economy can support. Any individual today can go on the Social Security website and it will actually show you your personal social security account as if it were a brokerage statement. But unlike a brokerage statement, there are no assets---just a promise to pay. What they will not show you are your personal liabilities owed to the government, because we pretend individuals don't owe it. If it were there honestly, you would find you owe more money than you will receive, if we had actual transparency. Our entitlement system is not a mere transfer payment system, which by comparison would be almost harmless; it is a true Ponzi scheme, and therefore not sustainable. All economists know this of course. I honestly believe most politicians really do not understand this. Ryan's proposal at least transparently addresses the problem of entitlements for all to see. Yet it sits out there in no man’s land within the GOP, with no visible alternative in sight. Entitlements are called the third rail in politics for a reason. I believe the reason the GOP fears this issue, as all past politicians have, is there is genuine concern that the so called tea party movement, which put the GOP back in power, is not really the vanguard of a fiscal restoration movement. Rather, they fear it is a more traditional “don't gourd my Ox" movement. Maybe it is; if so then we really are at the beginning of the end for the American Empire. Sarah Palin is the first presidential "hopeful" to come out aggressively in support of Ryan, while recognizing it is not a "perfect plan". Implicitly and explicitly, therefore, she is the first candidate to support an actual existing plan to reduce entitlements in exchange for a more free market based savings and healthcare system. This is different than supporting a non-existent or incoherent plan spouting platitudes. This is significant in my opinion. The GOP candidate that can carry this message forward without alienating the people, who must elect them, will have achieved a historically significant accomplishment. It is very hard to be the bearer of bad news such as; "we are not taking anything away from you because you already don't have it. Rather, we are creating a system where your savings and health care consumption are not empty promises". I do not pretend this is politically easy. But, as a nation, we need to do this. Of course, as has been obvious for 2 years, the GOP has no respect for Palin. It even borders on hate or disdain. They disdain her because they believe she won a lotto ticket when McCain put her in the spotlight, (which she did). They hate her because she is popular and uncontrollable, also true. They disdain her because they believe she is vain and self absorbed ---I disagree---but certainly no more so than other candidates. They hate her because they think she is stupid. This implies those who say so are smart. To quote Steely Dan from “Reelin’ in the Years”—“you’ve been telling me you were a genius since you were seventeen, and all this time I’ve known you, I still don’t know what you mean”. This obsession with “smart” and politics is the ultimate misunderstood red herring. Finally, and most of all, they hate her because they think she will lose—which only an election can determine. Consequently, and most recently, we see the spectacle of my home state (and town) governor, Chris Christie, yukkin’ it up with Jimmy Fallon on the dopiness which is Palin. I like Christie a lot, but now less so. 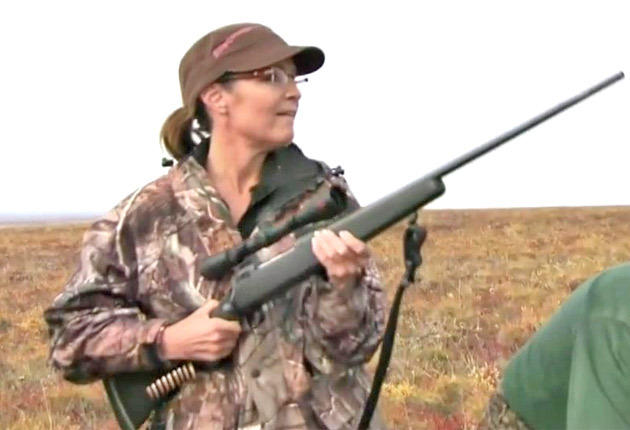 We see the shocking gracelessness of Big Barb Bush wishing Palin would just go back to Alaska. We see Karl Rove invoking the empty concept of missing gravitas as Palin does an Alaska Culture and Travelogue show on TLC. Gravitas in politics? Is he kidding? Which politician had an 11th commandment? I forget. As Palin said after the disgraceful comments of Christie and Ms. Bush, “let’s have the competitive process determine who will be both candidate and president”. I believe the person who will be chosen for both is the one who can, among other issues, best articulate our fiscal problems and actual solutions, in a way which persuades people truthfully. Such a person also has the potential to be an historic figure. I don't know if this person is Palin or not, nor does she. But her support of Ryan’s plan, despite its weaknesses, is a step in the right direction. So far, Jumpin' Joe Biden said it best, even if partially in jest; "It is a mistake to underestimate Sarah Palin". Please go to David Horowitz' site to also view this and other essays. Mike, you know I think you intellectually outrank every person in these United States but the Palin fanfest is too much for this Buckley conservative. Sorry, but how can she win over the moderates and lifelong O.G. (original gangsta) conservatives with her sound bite comebacks? I do care who is writing her missives, and I'll bet she's reading them out loud while trying to sound out the big words. I don't really understand the hate fest for Palin. Not at all. I can see how she can grate on people (I mean, I like her and she grates on me). She is polarizing (whether I like it or not). And maybe at the end of the day I cave and just agree with every one I know on this. I am virtually certain (not 100%) that I do not know any people who really like her and very few people who do not out right dislike her. She appeals, I guess, to the non-coastal crowd (and me for some reason). I listed all the reasons the GOP dislike her and I think I have covered the territory on that. I can think of those reasons because I think I see why people feel that way. But what I actually believe is people some how see her in a way that is not accurate. That is, if she put on a Mitt Romney "gorilla suit" (pick your favorite) and spoke with a TV news anchor accent she would be viewed differently. In any event, my opinion is not important (any more or less than any other person). Assuming she decides to run (lets call that 50/50) she will have nowhere to run and nowhere to hide. And we can see how she really is in a competitive "heads to heads" competition. It will be obvious for all to see if she is qualified---or at least it should be. Having said all of that, Palin was not the main point of my essay---she was the secondary point. The main point is we are on a highway to Hell as a nation and all of our smart and serious geniuses out there in GOP land are all focusing on derivative and short term issues. I was merely pointing out that Palin actually took a stand on long term entitlement reduction. Meanwhile, as a counter example, the "Mittster" is trying to be clever by opposing the proposed tax deal. He is posturing on this and that is extremely irritating. He is also wrong. Palin supports it. She is right for many reasons and he is wrong for many reasons. This continues to be my point about her versus many other candidates. She is rarely wrong on the issues. What Constitutional Right to Build the Ground Zero Mosque? Just Another Long Day's Journey Into Night?